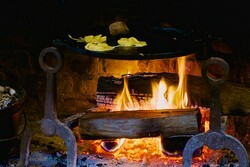 Kathy Browning, Adele Schnell, and Christine Ierardi worked hard prepare fritters and other apple-based dishes over the open hearth in the historic Jacob Blauvelt House. “The aromas and scents wafting through the house were a delightful addition to this year’s festival,” said Clare Sheridan, Society President. The HSRC’s fall festival was put together by a dedicated group of hardworking volunteers, including students from St. Thomas Aquinas College and HSRC trustees, members, and friends. On October 19, the HSRC will present a self-guided walking tour of historic homes and landmarks of West Nyack, co-hosted by the historical and civic memberhip organization Heritage of West Nyack. This tour continues the HSRC’s long tradition of presenting Historical House Tours, which dates back more than forty years, to raise funds to support the Society and at the same time promote awareness of local history and our beautiful built environment. The 2013 walking tour of West Nycack, sponsored by Beckerle’s Remodeling Showrooms, will take place from 10 am to 4 pm on Saturday, October 19. Showcasing West Nyack’s history and charm, the self-guided tour offers a look at historically significant buildings of West Nyack together with eclectic and charming residences. This event also kicks off "A Weekend in West Nyack," presented by Heritage of West Nyack. Reserving tickets for the tour in advance is strongly recommended; they are available through the Historical Society of Rockland County (www.rocklandhistory.org) and will be held for pickup at the Traphagan Farm House, 131 Germonds Road, West Nyack, on the day of the event. Advance tickets are $35 per person ($45 with the optional luncheon at the Clarksville Inn). Tickets will also be for sale on teh day of the event at the Traphagan Farm House for $40 per person ($50 with lunch). On October 26, the HSRC will present a "Walk Through History" in the Village of Suffern led by County Historian Craig Long. This is a unique opportunity to spend the morning with fellow history enthusiasts and our County Historian. Admission to the walk is free, but reservations are required and can be made by contacting the Historical Society of Rockland County. For more information about all of the Rockland History Month events at the Historical Society of Rockland County, visit www.RocklandHistory.org or call (845) 634-9629. For more information about Heritage of West Nyack, visit www.HeritageofWestNyack.org. The Historical Society of Rockland County is a nonprofit educational institution and principal repository for original documents and artifacts relating to Rockland County. Its mission is to acquire, preserve, and exhibit objects, buildings, and sites that reflect the history of Rockland County and the Lower Hudson Valley and to research, document, promote, and publicize the county’s rich historical heritage for the people of Rockland. HSRC’s headquarters at 20 Zukor Road, New City, NY, consist of a four-acre site featuring the 7,200 square foot History Center; the historic Jacob Blauvelt House; and the post-and-beam Historic Barn and Carriage House. HSRC is open, during exhibitions, events and programs, five days a week (Wednesday-Friday, 10 am–5 pm; Saturday–Sunday, 12–4 pm). Library research and tours of the Jacob Blauvelt House are available by appointment by contacting (845) 634-9629. For additional information about HSRC, visit our website at www.RocklandHistory.org. HSRC on the Radio: 100th Episode!